Do you love painting landscapes outdoors but are daunted by all the different greens around you in summer or spring (in my case, living in Western Washington, I see evergreens all year around). 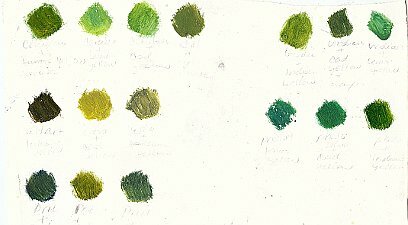 This page shows you how to take control of the green colors and make them manageable in your paintings. Painting landscapes should be fun, and it will be when you have the knowledge you need to handle colors with confidence. Ditch any tubes of green paint you already bought. Instead, mix your own greens using yellows and blues. You will come up with a wider range of shades of green and your colors are more likely to harmonize. When you mix darker greens, start with blue and gradually add yellow. If you want a lighter green, start with yellow first and then add blue. Doing it this way will save you some paint. When I started painting landscapes outdoors, I kept ultramarine and cadmium yellow light or lemon yellow on hand. I stuck to the same palette for a while until I became totally familiar with the possible colors I could mix. After I had become proficient mixing greens with those colors, I realized it would be helpful to add more blues and yellows to expand the possibilities. Cerulean blue and the same yellows above. The green mixtures from ultramarine tend to be warmer and lean toward red. Mixtures with thalo blue are vibrant and make a strong summer green if it used with lemon yellow (a bluish yellow). Thalo blue is a very strong blue and has a very strong staining power. On the other hand, mixtures with ultramarine and lemon yellow do not work so well if you are after a bright summer green. The red in ultramarine blue works as a complementary to the green in lemon yellow. Hence, the green you get is dulled. Below is a test chart of the greens I created with the blues and yellows mentioned above. Remember, the goal of these “tests” was to get a feel for the ratios of yellows and blues needed to create the different greens. Of course, these are only a small fraction of the greens you can mix, so go mix some blues and yellows of your own. If you must add a tube of green paint into your palette, consider the following two. You may find viridian green (a strong bluish green) or a sap green (a very transparent yellow green) helpful. Monet used emerald green in his palette. When painting landscapes, You might decide to go against this advice and find some wonderful green that suits your need. If you do, then stick to it until you know how it works with the rest of your colors. Once you have done your practice green mixtures from the tube colors, you can modify it by adding a bit red, or a touch of orange, or violet. Some greens might need to be more cool and powdery, so add white to obtain that effect. Some greens are bluish, so add more blue to them. Observe the color temperature after you add the non-green pigments while painting landscapes. Red and orange will warm up green. Violet will also usually warm up green color a bit—because it has red in it. Landscape paintings do not have to be green all the way through. Sometimes I try other colors to indicate the foliage, or the mountain in the distance. For example, water vapor in the air adds a veil to everything so the green objects in the distance may actually look violet or blue. When you are surrounded by an overwhelming abundance of greens, the tendency is to just copy everything literally—maybe too literally. 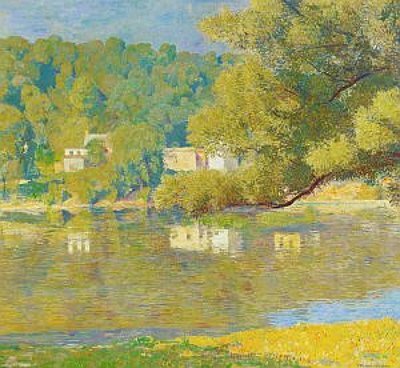 Below is a painting by the American impressionist Daniel Garber which illustrates how he used different greens and other colors to achieve a harmonious and interesting landscape painting. Garber used bluish green, yellow green, some red in the shadow of the green foliage, orange green on the lit side of the distant fores, violet in the reflections of the forest, etc, By doing this, he created a cascade of interesting and rich green colors, but his palette did not actually have that many green colors. Sometimes you need to use your artistic license and add some different colors in order make an interesting painting (rather than slavishly copying everything exactly). Also, keep in mind that when you stare at one object for a long while without scanning around it, the color of that object can start to become dull and much grayed. That is why it is important to learn how to see colors in the first place. Now that you have learned the ins and outs of working with greens, it's time to put the knowledge to work. So take out all your blues and yellows, start mixing them, and see what happens. Get out there and start painting landscapes. 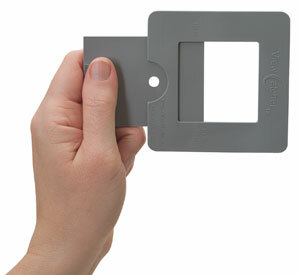 The classic in color mixing that you would find valuable! In painting landscapes, learn mixing greens and more here. 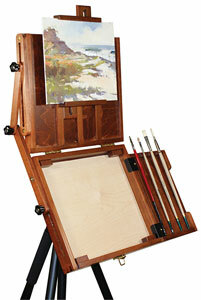 More compact and lighter to carry than a French easel on the field!